The past year has been one of shifting roles. I quit a tour-guiding career of eight years (which is long for a 30 year old), became a father, and finished grad school. With my new roles came a shift not only in what I do, but also in who I am. The biggest transition has been from working 40-60 hours a week to being the primary caretaker of my daughter. I have never been good at errands—even simple errands done on my own would exhaust me. So, the prospect of running most or all of the errands for our family with a baby was daunting, if not petrifying. It did not go well at first, which made me question whether I could even be a stay-at-home dad. I wanted so badly to take care of our daughter so my wife wouldn’t have to run errands and care for the home as well as work. The chalkboard-painted wall I used for my to-do list was a constant source of anxiety motivating me more to escape and watch Netflix than to be productive. Thankfully I started to get better. I hadn’t realized how much practice errands and housekeeping would take in order to do it well. Over the past four months, since defending my thesis, I have grown tremendously in my competency as a stay-at-home dad. I can even enjoy multitasking—managing a list of things to do all while keeping a 10 month old alive and happy. That’s not to say everything is perfect. 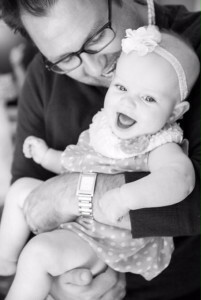 My daughter’s newest favorite pastime—pulling her bib off while I’m feeding her—is a lot for me to handle, and I get jealous seeing my wife come home and have so much energy to play with her and make her laugh while I often can only muster the energy to prevent her from melting down. I’m sure this too shall pass and I am getting better at finding joy in the present with her and cherishing every little step in her development. When I’m not chasing after my increasingly fast and destructive daughter, I am attempting to start a career. After years of work and late night study sessions I finally finished grad school in December, and I am applying for teaching jobs. There is a sense of being in the wilderness during this transition, not knowing the path or even the destination. Early on I was feeling lost and hopeless about job prospects. This brought about financial worries and brought up deep insecurities around my fear of being rejected or passed over by prospective employers. You might even call it a mini existential crisis. After some great encouragement from a friend and my wife, and a lot of prayer, these feelings have lessened. I have come to see being in the wilderness as an important experience that allows me to develop patience and reflect on other shortcomings and insecurities. I’ve even been able to see very clearly the providence of God through a few extra jobs and medical expense reimbursements and aide. Practicing patience and silence is difficult in a time where all I want to do is stress and vacillate between escapism and attempting to solve everything on my own because God is taking too long. Thankfully I have an adorable little companion to practice with and learn from. This morning I spent time in the amazing San Francisco Botanical Gardens with her. As I pushed my daughter in her stroller, along the small dirt paths through the Native California garden, I talked to her about each of the different plants that we passed and we sat and admired them together. Sometimes she would reach out to grab the plants. Taking time to feel, smell, and taste them, to experience them for the first time. At one point she grabbed a California Poppy, my favorite flower which I learned to love during my years driving a bus. This particular poppy was the only one in bloom in the entire garden. I watched her discover for the first time something I have loved and cherished for years. It was so beautiful. I’m not sure what it means, if it means anything, but I will never forget the overwhelming feelings of love for my daughter and God’s love for me in that moment in the garden. 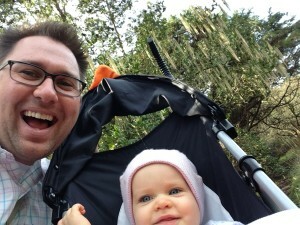 Being a stay-at-home-dad and struggling to find work was never in my five- or ten-year plan. I may have never asked for this experience, and I did not know what it would require of me, but I am grateful for it. There will certainly be other unexpected roles that will challenge me in the future, and I will greet them with fear and trembling knowing that whatever they are, they will bring me closer to God. “Diapers and Degrees” was written by Danny Gluch. Danny grew up in the suburbs of LA with his parents and older brother. He moved to the Bay Area in 2002 and has enjoyed calling San Francisco home ever since. Currently, he, his wife, their daughter, and their dog Madison call the Mission District of SF home. After struggling to find an enjoyable area of graduate study, he found the Philosophy program at San Francisco State University, where he recently earned his MA writing his thesis in Feminist Ethics and Moral Psychology. Any extra time is spent with his church community, or playing golf (or practicing golf, or thinking about golf). Find Danny on Twitter @danandstephinsf. 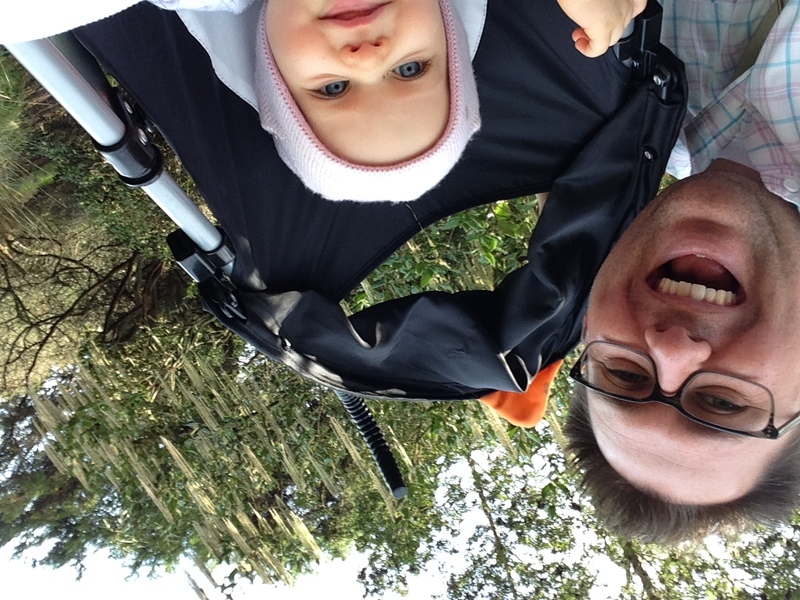 This entry was posted in Guest, Role & Place and tagged baby, California, career, daughters, fatherhood, fathers and daughters, God, graduate school, parenting, purpose, San Francisco, stay-at-home-dad, transition, vocation. Bookmark the permalink. Danny, here is what I love. You wrote your thesis on Feminist Ethics and now you are changing your daughter’s diapers in Target. It takes a lot of courage to challenge the norm and wait for the next step. Enjoy those moments with your sweet girl. They pass so quickly-some much to our relief like changing a wiggly baby on a changing table 🙂 or handling a delicate flower! Your daughter is blessed to have you home with her! I remember all too well those harried trips through a store with an unhappy baby or toddler. It was never fun—you always feel like people are either pitying you or blaming you for not being a “better parent.” I’m guessing that being a dad might even compound that feeling, like people are looking at you shaking their heads, which would be so frustrating! Anyway, you are doing an amazing job, and, like Lisa said, your daughter is very lucky to have this time with you. Thanks for sharing this chapter of your life from your heart. Danny, this piece is so wonderful! I hardly know what to say. I admire you greatly, and oh, how blessed your little girl is to have such an insightful, loving father. The story of you and your daughter in the botanical gardens is beautiful. I can just see her touching the poppy, perhaps being surprised by its color and texture. May the beauty you receive from the time you spend with her serve as a rich reward for this hard work called parenting. I loved meeting you through your words. Thank you.